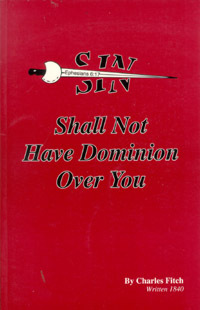 Sin Shall Not Have Dominion . . . ! In compliance with your request, and my promise, I will now endeavor, in the fear of God, and under sense of my accountableness to Him, to give you my views in full, respecting the points embraced in the questions which you proposed to me – Does God propose, through Christ Jesus, to grant unto all men deliverance, freedom, and Victory over every sin they are willing to surrender and yield to Him ? And did JESUS really come “to save us from our sins?” Matthew 1:21, as the Holy Scriptures assure us throughout both Old and New Testaments ? And may “the redeemed of the LORD return and come with singing unto Zion, and everlasting joy be upon their heads; and may they obtain gladness and joy, and sorrow and mourning flee away” (Isaiah 51:11). Then shall the “joy of the Lord be our strength” (Nehemiah 8:10). – Brother Charles Fitch. Click Here to read or download the full text of this most powerful booklet !